Home > Timesheets > Timesheets - FAQs > How Can We Track Time Against Different Types of Work? Time is entered against the Project & Timesheet Category. Timesheet Categories allow you to track time against different types of work, e.g. research, development, etc. You can set up a list of default timesheet categories (via Settings > Timesheet Settings) that are automatically added to all new and/or existing projects. Alternatively, you can set up categories without defining them as Default and only pull them into specific projects as needed via Project settings > Add Timesheet Category popup. All categories in a project are visible to all timesheet users for that project. They also define whether work is billable or not, and can additionally have billing or cost rates attached to them. To add categories, head over to Settings > Timesheet Settings > Click ‘Add Category’. 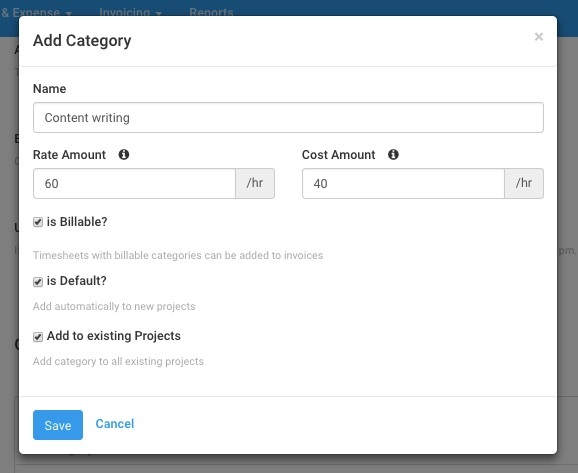 While adding a new Timesheet Category, you can define it as Billable and/or Default. Checking off the option ‘Add to existing projects’ will automatically add it to all your current projects. Reports such as Timesheet Summary provides insight on how your team’s time is spread across different categories for a specific date range. Please note: When calculating Timesheet Costs, we prioritize the Timesheet Category Cost Rate over the Person Cost Rate. If you would prefer to use use the Person Cost Rate, then do not enter a cost rate for Timesheet Categories on that project. Once added to a project, a timesheet category cannot be deleted from the Settings > Timesheet Settings page even if there is no time tracked against it. In this instance, you will first need to delete the Timesheet Category from each Project it has been added to, before deleting the Global Timesheet Category from Settings > Timesheet Settings. If you need to delete timesheet categories that have no time tracked against them, you can contact our support team via chat or by emailing support@avaza.com. Read more about tracking time with Avaza in our Getting Started with Timesheets guide.